VIPAccessEXCLUSIVE: George Dalton Interview With Alexisjoyvipaccess At His “Trap Queen” Music Video Release Party! Incredible singer, sensational actor, and a magnificent YouTube star: the wonderful, George Dalton is truly a triple threat! Meet George Dalton – a name you’ll be hearing a lot of times as he is truly taking over the entertainment world by storm! The marvelous George Dalton exhibits his talent in the highly-anticipated, sensational Netflix show, Wet Hot American Summer: First Day of Camp and his charm and fun-loving personality wins over the hearts of viewers worldwide. In addition to being a remarkable actor, the brilliant George Dalton is also a fantastic singer. George Dalton proves how much of a gifted singer he is as he recently premiered the music video to his cover of “Trap Queen”. Putting his own jazz twist / rendition to the chart-topping rap hit, the amazing George Dalton’s “Trap Queen” cover is absolutely spectacular! The outstanding George Dalton never fails in impressing all of his fans and supporters and this young man truly continues to have a bright future in the bustling entertainment world! I, Alexisjoyvipaccess had an amazing time covering George Dalton’s stellar music video release party for his cover of “Trap Queen” and had a terrific time interviewing the one and only George Dalton at the event! George Dalton dishes exclusively to Alexisjoyvipaccess all about what it was like working on set of his music video for “Trap Queen”, about his character in Wet Hot American Summer: First Day of Camp, and so much more only in our VIPAccessEXCLUSIVE interview! Hear what the multi-talented George Dalton had to say only in our VIPAccessEXCLUSIVE interview below! Thanks for the fun interview, George! Check out my VIPAccessEXCLUSIVE interview with the exceptional George Dalton at his “Trap Queen” music video release party below! 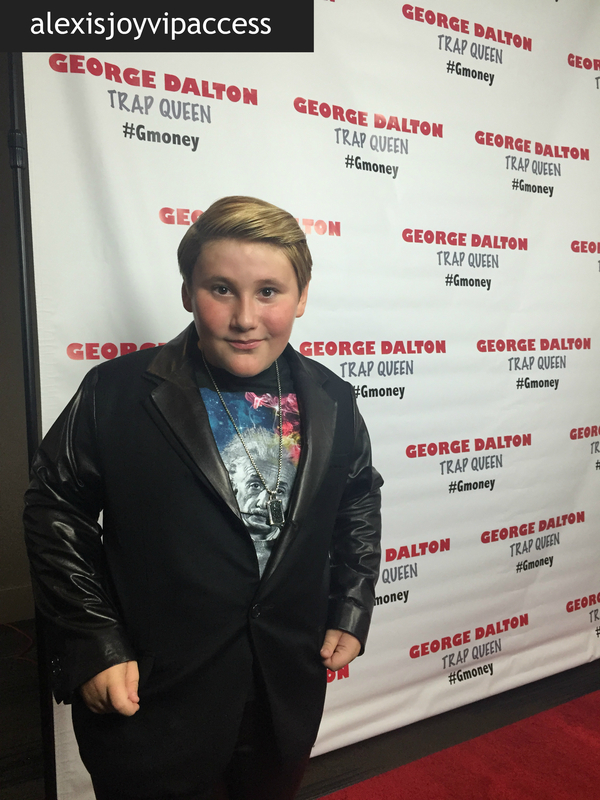 George Dalton had an excellent release party for his “Trap Queen” music video! What better way to celebrate the release of a terrific music video than with some photo-booth fun, opportunities to get a hat airbrushed with Active Airbrush, fortune-telling fun and of course, seeing George Dalton’s great “Trap Queen” music video and seeing George Dalton and Jordyn Jones perform! What a stellar night. The amazing George Dalton wore a Jonathan Logan blazer and pants, Creative Recreation shoes, and a Tribal Hollywood black diamond pendant necklace to the event. George Dalton was styled by the sensational, celebrity stylist, the fabulous: Ali Levine! Be sure to watch George Dalton’s magnificent “Trap Queen” music video below and be sure to share it around on all your social media networks and to all your friends and family! Previous Article: Monty Geer Has A Blast At The LA Premiere Of “SMOSH: The Movie”! Next VIPAccessEXCLUSIVE: LJ Benet Interview With Alexisjoyvipaccess At George Dalton’s Music Video Release Party!